A creative life is filled with joy that is corralled by self inflicted anguish and drama. An insightful sage once said “ each man lives his life in quiet desperation“, and women live their lives in anguishing self doubt. Both men and women internalize and perpetuate distractive random memories by not living in the NOW. But to live in the now is a nirvana that one can only experience momentarily. The insightful sage (me) also said “the man or woman who clears the mind of memories is on a fool’s journey.” Exploring our memories can, and often does bring a sense of self awareness both good, and for some not so good. Would you want to erase the seminal moments in your life when you felt the most joy and the most secure? Probably not. I have come to the realization that I; like you, are filled with many memories associated with experiences, some being wonderful and some not so much, but I can honestly say life will deal you a pretty good hand if you focus on the good. We all get an abundant share of good if we are open to it. Abraham Lincoln once said “ People are just about as happy as they make up their mind to be.” You might want to let that sink in, it’s not exactly a spiritually guided thought, but sometimes a little nudge will do the trick to get us back onto a positive emotional trek. When I painted Memories of memory, it was one of those start-stop works that wouldn’t come to fruition and talk about memories it was loaded, every applied brush stroke conjured up a whole slew of memories, some recent; many were short clips of times long past. Considering what I wrote above I feel obliged to reveal some of those memories, and what it means to creativity; Some were broad like staring into the Grand Canyon; fast moments in time, panoramas if you will, others nonsensical thoughts tied to images that for all practical purposes makeup ones daily life. Memories are things: they most assuredly contribute to creative outcomes. To read the exciting conclusion; click web link in bio. If you just arrived here from Instagram, Twitter or Facebook welcome. I’ve been asked a bunch of times, “Rod, what’s going on in your mind/head while you are painting”? It was even suggested by a famous Las Vegas Magician, “that there must be some ethereal magic happening in that right sided brain of yours.” While I took that magicians words as a complement, I knew it was a bit far from the truth. Yes they’re many tangible and intangible thoughts, but most of the time my mind is filled with random memories. It could be the result of some of the repetitiveness in my artistic style; Receptive Abstract Patternism, but for the most part; it’s stuff occupying space in a mind that in other words could become mind numbing to the task at hand. So what are these randomized memories, and what do they represent? There is one caveat that must be shared first; when I paint, I often listen to classical music, which can and often is the catalyst of memories. Flashbacks abound when you think of the musicians and the instruments they’re playing. But more to the point, my thoughts are mostly full of childhood memories, when innocence triumphed. My days on my grandparents farm, the food, the soil, the animals and especially their nurturing care. Memories of growing up in a very small mountain summer vacation community. The summers were loaded with out of towners and mountain entertainment: a lake, a roller rink, miniature golf, hiking, horseback riding, and weekenders who brought their kids to play with; and as we grew up the inevitable Summer romances. And for those vacationers who reached the age of 21 and beyond, they might not draw a sober breath during their whole mountain vacation due to the fact that my mountain community had an unusual amount of watering holes. All to quickly as my memory serves… summer and the merriment was gone; yielding to the winter that assuredly brought on a peaceful solitude and where a young boy could daydream, nurturing a spirituality of creativity, perhaps somewhat delusional, but oh so fun, and foretelling of a life yet to come. It’s memories like these that flow in and out like the tide surrounding the island of my thoughts. They never coalesce enough in a thoughtful memory to direct a work of art into something immediately recognizable. 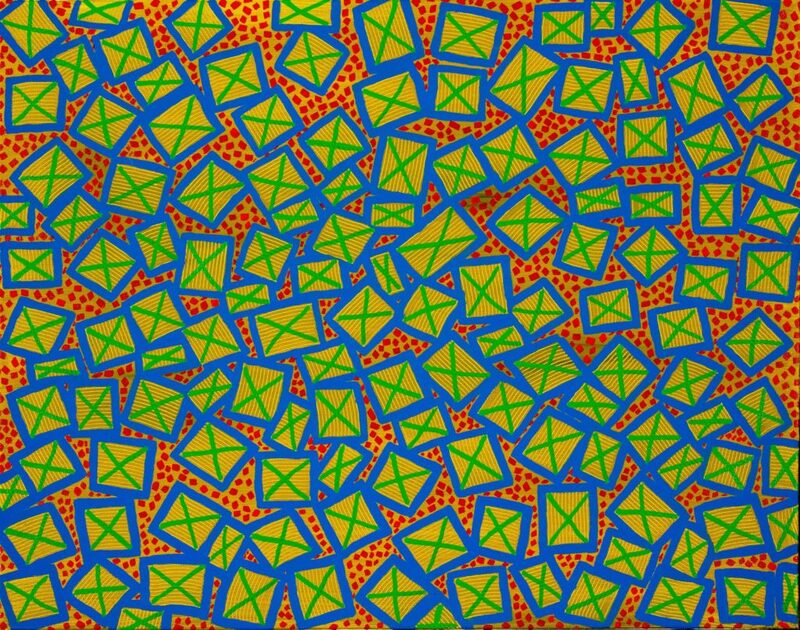 Hence, the descriptive word, “receptive” in my Receptive Abstract Patternism style. The art style I embrace. You can explore your own memories while you paint. I would love to hear your thoughts. Posted in Receptive Abstract Patternism, Rod Jones Artist and tagged art advisor, art collector, art consultant, art curator, art museum, childhood memories, contemporary art collector, crestline, interior design, interior designer, kunst, memories, Receptive Abstract Patternism, Rod Jones Artist, summer memories, summer romance. Bookmark the permalink.